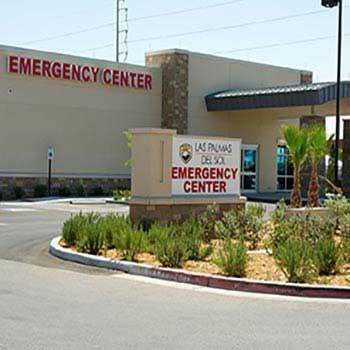 The Las Palmas Del Sol Free Standing Emergency Department (FSED) on the northeast side of El Paso, operates 24 hours a day, seven days a week and is located at 4740 Loma Del Sur. The Las Palmas Del Sol Emergency Center features 9 multipurpose exam rooms (one of which is a trauma room); a CT scanner, a diagnostic radiology machine, ultrasound, and its own stat lab for onsite immediate results. The center is staffed by board-certified physicians affiliated with Las Palmas Del So Healthcare as well as trauma-certified nurses. The onsite medical team is able to treat all urgent and emergent medical conditions such as heart attacks, strokes, head and spine injuries, respiratory distress, abdominal pain, dehydration, orthopedic injuries, sports injuries and lacerations that require sutures. The center provides the public with board-certified physicians–with experience treating trauma-related injuries and medical emergencies. We are pleased to be on the cusp of this growing national trend in emergency health services that is a great benefit to the public and we are pleased to provide this service to northeast El Paso and surrounding areas. The Las Palmas Del Sol FSED works closely with area emergency transportation providers to provide convenient and quick emergency care for east El Paso and surrounding communities.